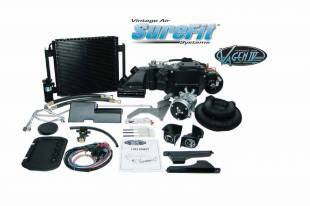 1.Vintage Air's Tri-five Chevy Sure Fit kits include Tite Fit compressor hard lines. Lines are now re-routed through core support and drier mounts behind. These kits may be upgraded to include the polished Tite Fit line kit and the popular polished Proline compressor/alternator bracket. 2.If you are using a cross-flow radiator see Vintage Air's condenser kit. 3.Some installations may require additional engine pulleys not included with kits. You must provide pulleys, v-belts and refrigerant. 4.If you are retaining the original 265 or 283 V8 engine in your car you may need to upgrade the harmonic balancer and pulleys. You will need to upgrade from the generator to an alternator. 5.Contol panels are not included but are available for an additional price. KIT PHOTO SHOWN IS WITH A CENTER VENT. Should you buy a “Complete Kit” Or An “Evaporator“ Kit? “Evaporator” kits include: Evaporator and bracket, louvers (when required), duct hose, wiring harness, new controls or Cable Converters, hardware and installation manual. Essentially all the components and accessories for the inside of the vehicle. The “Complete Kit” is just as it sounds and includes: Everything that is in the "Evaporator Kit" plus all under-hood components such as compressor, engine brackets, condenser with brackets, pre-formed refrigerant lines, drier, fittings, hard- ware and installation manual. We recommend ordering a complete kit for reliability and optimum performance. 1. 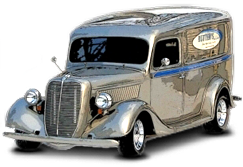 What is your vehicle make, model and year? 2. How much room do you have behind the dash? 3. What is your engine? 4. Do you already have Factory Air or Non-Factory Air? 5. Electronic Kit or Cable Kit? 6. Do you have Headers? Yes or No If yes, what kind? 8. Do you have a short or a long water pump? 9. What side is the alternator on?